Living in West Palm Beach, as in South Florida, I cook and bake quite a few different recipes in a short period of time due to the temperature. And usually from November through March I try to cook everything I love from the winter schedule. Chili will be first on the list of preferences. How many different chili recipes can you eat? Obviously quite a few. There are two that stand out in my life. The first one was in New York on the upper west side in a typical bar restaurant (name unknown) and the second at “Ski Apache” in Ruidoso, New Mexico. A very special friend used to take me to the one in New York and that was the first time I had chocolate in chili but it will always be in my chili recipe since that meal. 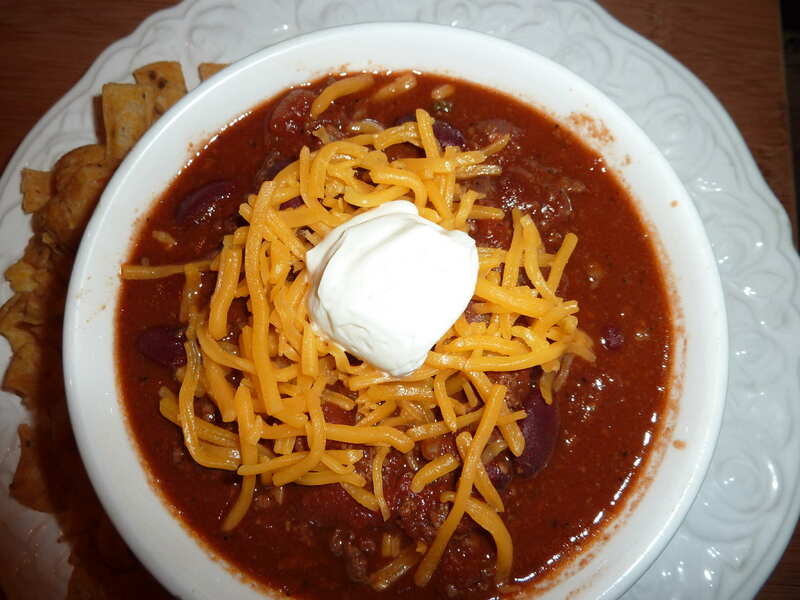 The second was at “Ski Apache” on a family vacation (to be fair, at lunch after skiing all morning probably anything would taste good), but where the chili was set up it was a salad bar and all the toppings became another meal on top of the chili. I have yet to set up a “Chili Salad Bar”, but an evening of that meal would be more than fun. At “Ski Apache” they had five different cheeses, chopped onions or scallions, chopped peppers (red, green and yellow and from mild to really HOT), sour cream and a variety of chips (fritos, tostitos and chips in numerous sizes). 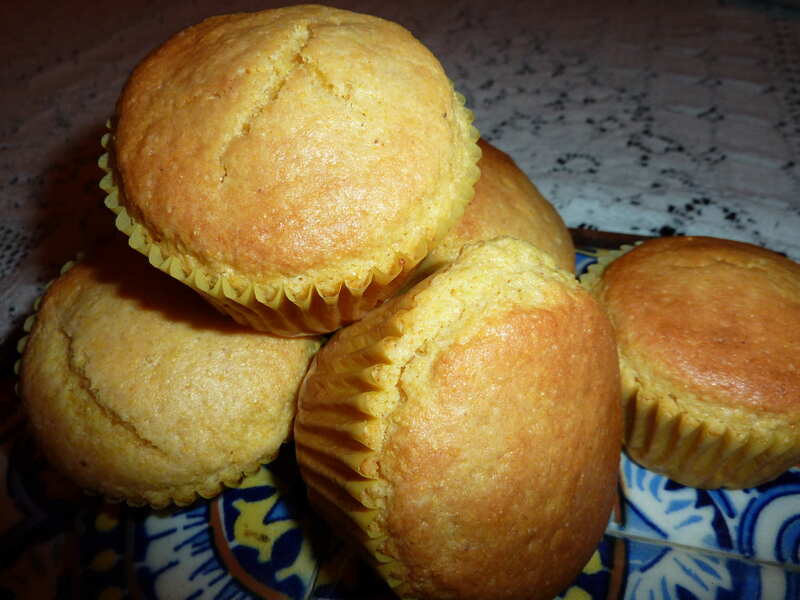 I love to have corn muffins with chili so I have included that recipe. Heat the bacon fat and onion in a skillet about 2 minutes. Add the ground beef and garlic and cook and stir about 5 minutes. Add the kidney beans, tomatoes, chili powder and chocolate and simmer for about 1 hour. Remove the garlic and serve with cheddar cheese, sour cream and fritos. Line 12 muffin cups with paper liners. In the bowl of an electric mixer fitted with a paddle attachment, mic the flour, sugar, cornmeal, baking powder and salt in a separate bowl, combine with the milk, melted butter and eggs. With the mixer on the lowest speed, pour the wet ingredients into the dry ones and stir until they are just blended. Spoon the batter int the paper liners, filling each one to the top. Bake for 30 minutes, until the tips are crisp and a toothpick comes out clean. Cool slightly and remove from the pan. This is a special note for hot weather readers since I don’t make chili that often here in Florida,I do not want one bean of taste to be wasted. Of course a hot bowl of chili the next day is wonderful for the northern people, but what do we do in the warmer states? I figured that out so I could enjoy the flavors in a few different ways. Heat chili in a pan while melting butter in separate pan. Fry eggs in butter (to your taste). 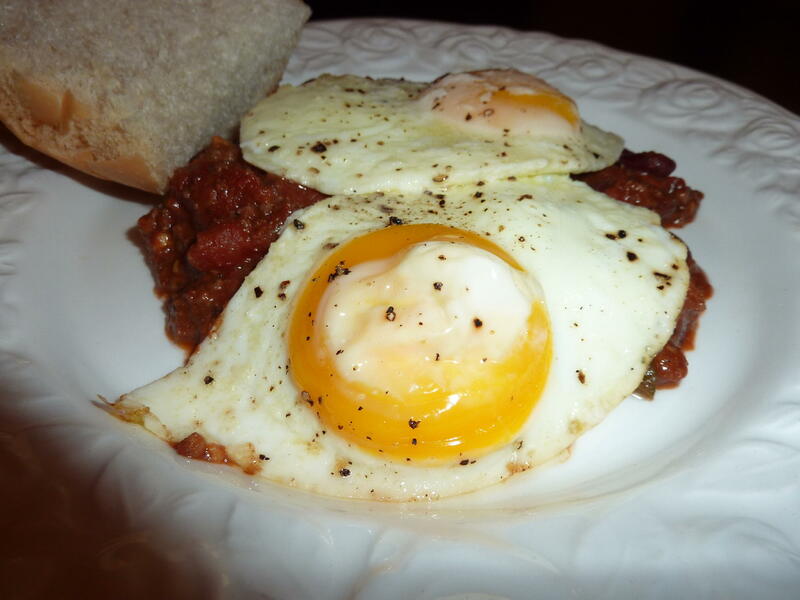 Plate chile and add two eggs per person. Add Bread, toast or muffins and enjoy! I’ve made a chocolate chili before and really enjoyed it. This recipe looks great.